Citation Information: J Clin Invest. 2018;128(8):3546-3557. https://doi.org/10.1172/JCI98093. The biological activity of 24R,25-dihydroxyvitamin D3 [24R,25(OH)2D3] remains controversial, but it has been suggested that it contributes to fracture healing. 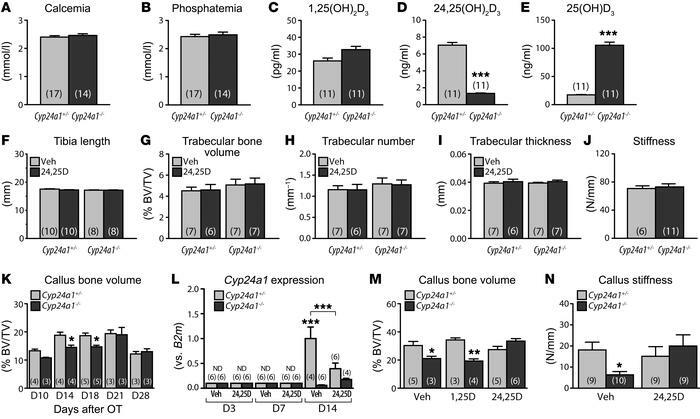 Cyp24a1–/– mice, synthesizing no 24R,25(OH)2D3, show suboptimal endochondral ossification during fracture repair, with smaller callus and reduced stiffness. These defects were corrected by 24R,25(OH)2D3 treatment, but not by 1,25-dihydroxyvitamin D3. Microarrays with Cyp24a1–/– callus mRNA identified FAM57B2 as a mediator of the 24R,25(OH)2D3 effect. FAM57B2 produced lactosylceramide (LacCer) upon specific binding of 24R,25(OH)2D3. Fam57b inactivation in chondrocytes (Col2-Cre Fam57bfl/fl) phenocopied the callus formation defect of Cyp24a1–/– mice. LacCer or 24R,25(OH)2D3 injections restored callus volume, stiffness, and mineralized cartilage area in Cyp24a1-null mice, but only LacCer rescued Col2-Cre Fam57bfl/fl mice. Gene expression in callus tissue suggested that the 24R,25(OH)2D3/FAM57B2 cascade affects cartilage maturation. We describe a previously unrecognized pathway influencing endochondral ossification during bone repair through LacCer production upon binding of 24R,25(OH)2D3 to FAM57B2. Our results identify potential new approaches to ameliorate fracture healing. Bone fracture phenotype of Cyp24a1-null mice. (A–E) Blood biochemistry in control and Cyp24a1-mutant mice. (A) Circulating calcium levels. P = 0.4568, by 2-tailed t test. (B) Phosphatemia. P = 0.2429, by 2-tailed t test. (C–E) Vitamin D metabolites. ***P < 0.001, by 2-tailed t test. (F–I) Static morphometry in untreated and 24R,25(OH)2D3-supplemented control and mutant Cyp24a1 mice. Bone length (F), trabecular bone volume (G), trabecular number (H), and trabecular thickness (I) were assessed by micro-CT. P > 0.05, by 2-way ANOVA followed by Bonferroni’s post test for F–I. (J) Bone stiffness was calculated from the 3PBT. P = 0.7420, by 2-tailed t test. (K) Fracture repair callus volume following intramedullary rod–stabilized osteotomy (OT). *P < <0.05, by 2-way ANOVA followed by Bonferroni’s post test. (L) Cyp24a1 expression in callus tissue from control and Cyp24a1-null mice, with or without 24R,25(OH)2D3 rescue. ND, not detectable. ***P < 0.001, by 2-way ANOVA followed by Bonferroni’s post test. (M) Rescue treatment with vitamin D3 metabolites of osteotomies immobilized by external fixator. *P < 0.05 and **P < 0.01, by 2-way ANOVA followed by Bonferroni’s post test. (N) Rescue of biomechanical properties by 24R,25(OH)2D3 administration. *P < 0.05, by 2-way ANOVA followed by Bonferroni’s post test. Data represent the mean ± SEM. The number of animals per group is indicated in parentheses. D, day; 24,25D, 24R,25(OH)2D3; 1,25D, 1,25(OH)2D3; Veh, vehicle.